Hiya guys, it's finally Friday and time to celebrate the weekend. I don't have much planned unfortunately, but relaxing at home is enough to make me happy. Maybe I'll watch a horror movie with the hubs or play some video games. It's the simple things, right guys? 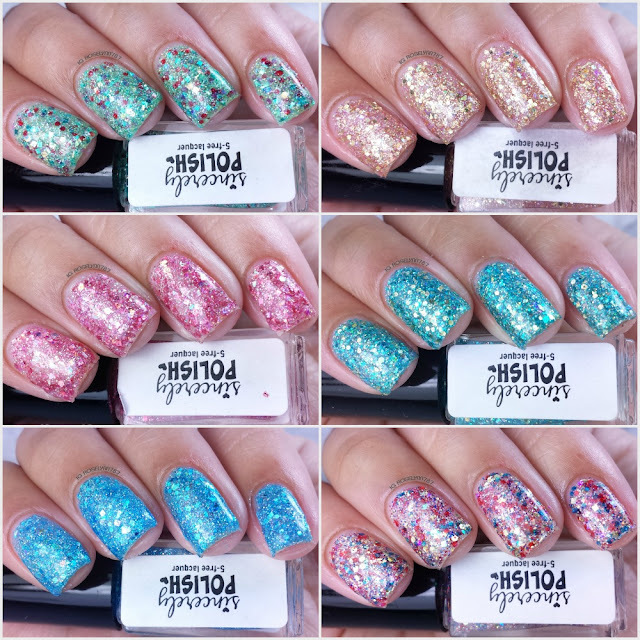 Anyway, for today I have swatches for the Simply Enchanted Collection by Sincerely Polish. This is a beautiful set of glittery polishes based on our favorite Disney Princesses. Simply Enchanted by Sincerely Polish is available for purchase in both full and mini sized bottles. The listings for the whole collection are currently sold out, as well as two of the individual bottles. Not to worry though, if you love these you'll be happy to know they will be returning. Jasmine is a holographic turquoise and gold glitter-bomb. Without a doubt we're starting off this review with my favorite polish in this collection. 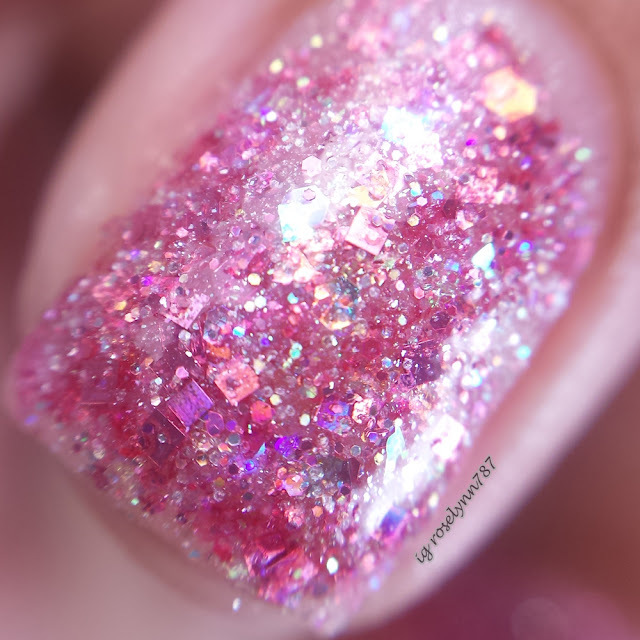 I'm head-over-heart-over-nails in love with the shade and glitter combination. The formula was much better than what I had expected for a heavy glitter bomb like this. I found the consistency a little thick, but not difficult to work with. This whole collection is intended to give you full coverage so no base is needed, but if you do use a base then you'll need less layers for an opaque finish. For these swatches, I used two thin coats and sealed with a topcoat. 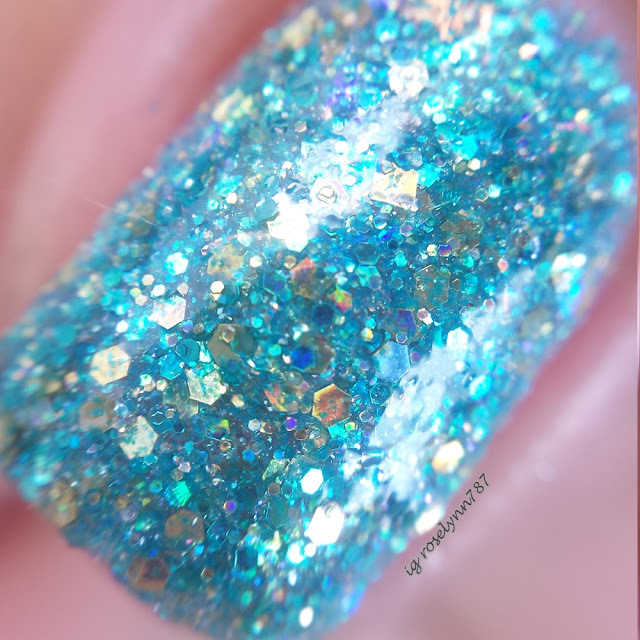 Cinderella is a blend of blue and silver holographic glitters dancing around an enchanting sheer pearl base with sprinkles of iridescence and shimmering flakies. My second favorite from this collection, and I'm sure that comes as no surprise judging from the swatches. From the color, to the glitters, down to the formula it is fiercely gorgeous. The formula was identical to Jasmine, a bit thick but completely easy to layer and work with. For these swatches, I used two thin coats and sealed with a topcoat. 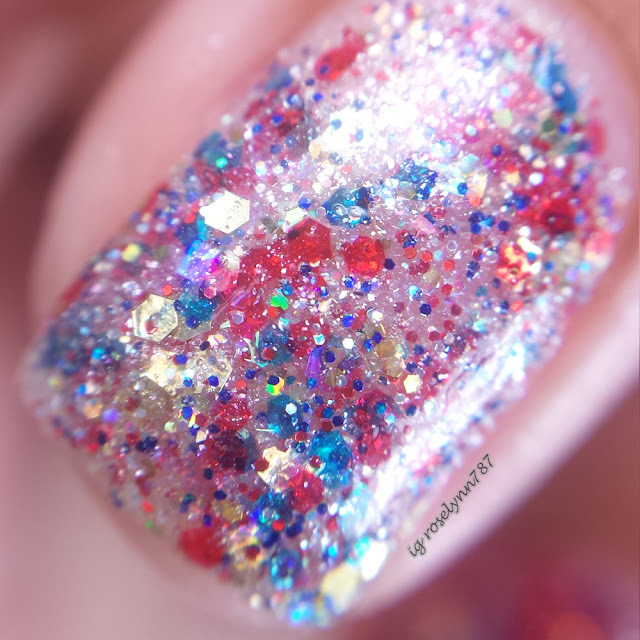 Snow White is a red, royal blue, and holographic gold glitters float in a shimmering sheer pearl base with hints of silver holographic glitters, iridescence, and rainbow flakies. Unfortunately this one is currently sold out, but will be restocked in May. Because of the lightness in color compared to the other two I expected some difficulty getting an opaque finish. That was not the case whatsoever! The glitters give excellent coverage in only three thin coats, but could have been fine with only two. The formula, although a bit thick, applied evenly and without any issues. Aurora is a gorgeous blend of pink glitters, twinkling rainbow flakies, and iridescent glitters in a delicate shimmery sheer pearl base. I can see how pink-lovers will totally go crazy over this shade, but unfortunately it's not one of my favorites. 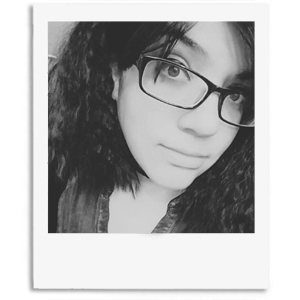 Formula felt a bit thicker than the others and I had a hard time layering without clumping at the tips. Also because of the light pink shade, it took an extra layer for an opaque finish. This is definitely one of the glitters in this collection best suited over a base color because it was almost unworkable alone. Swatched here is three thin coats and sealed with a topcoat. 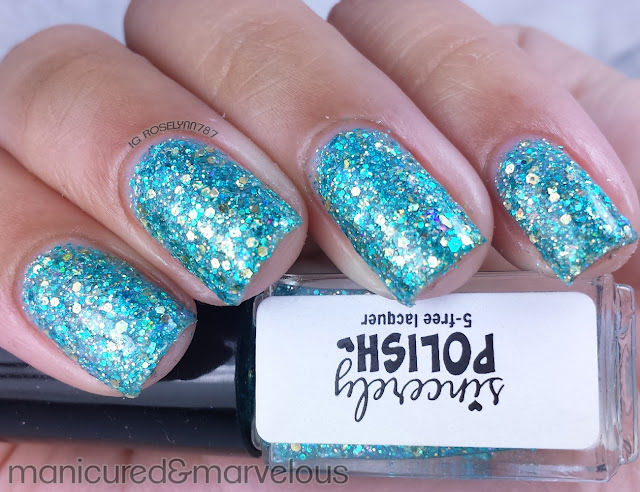 Ariel is a blend of turquoise, aqua, green and silver glitters swimming in a glimmering sheer pearly base. 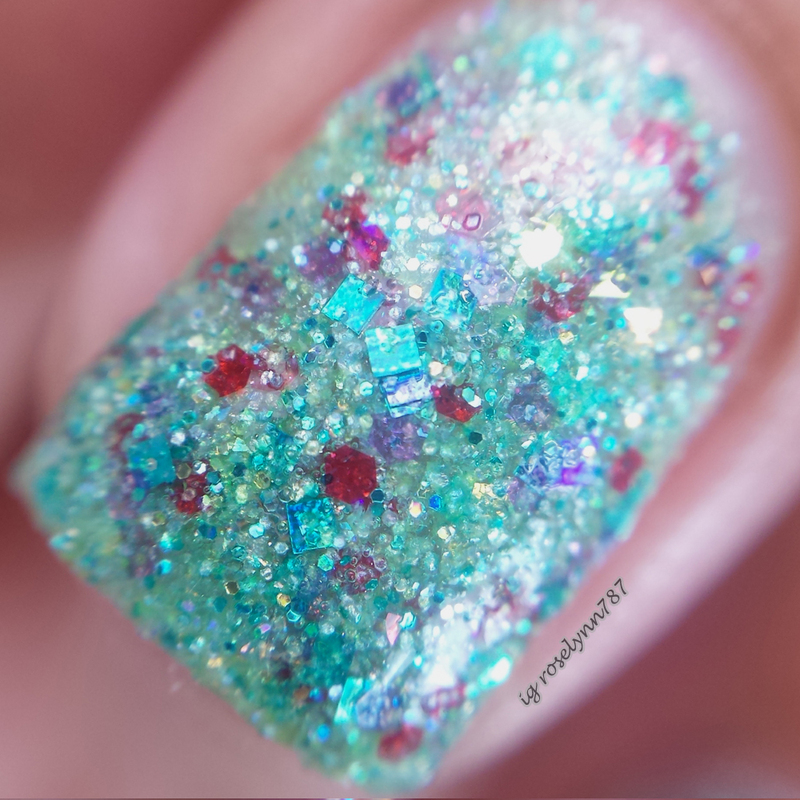 The one major thing that I personally love about this polish is the unique glitter and color combination. It resembles our favorite underwater princess very well! The formula for this one seemed to be as thick as the others, but it didn't cause much of an issue so long as I used very light layers. For these swatches, I used three thin coats and sealed with a topcoat. 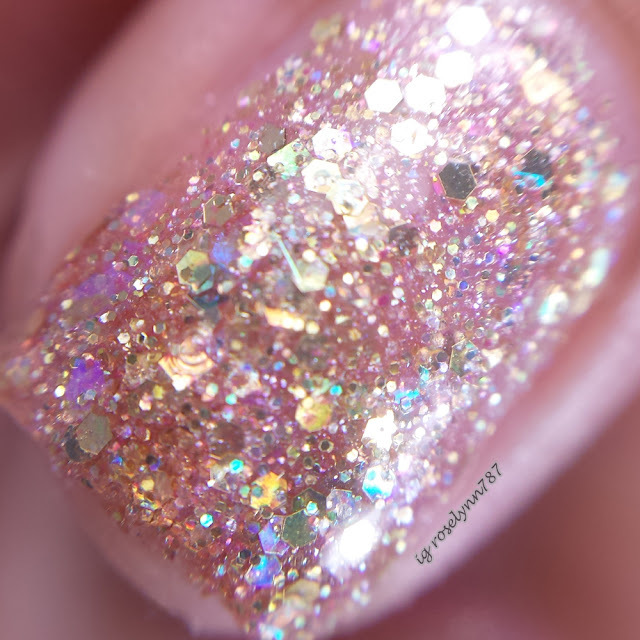 Belle is a gold glitter polish in a sheer pearl base filled with iridescence glitters, rainbow flakies and rose gold flakies. I'm always a sucker for a gold glitter polish like this because I think it makes the perfect accent to almost any mani. Very elegant, but not overwhelming. Formula, like all the others, did have some thickness issues. The key is to apply with thinner layers so that the glitter doesn't clutter up in spots. For these swatches, I used three thin coats and sealed with a topcoat. Overall I do like these glitters very much so and they give me fond memories of my favorite princesses. It's a shame that the formula throughout was thicker than I expected it to be. In some cases it applied without much trouble, but with others I really would have preferred to use it over a base. My personal recommendations are Cinderella and Jasmine, not only did I find their formulas easier to work with but the colors are incredibly stunning. It should also be noted that because of the thicker formula and heavy glitters, dry time is longer than normal. I use Seche Vite as my topcoat and even then it tended to take quite a while. Karen, owner of Sincerely Polish, has spoken with me about the formula issue and has reformulated once already to help with the problem. She also intends to reformulate again for her next big restock in May and further address the issue with the thick formula. That's A+ customer satisfaction, which is what always makes me come back to Sincerely Polish. So tell me guys, which one is your favorite from this collection? 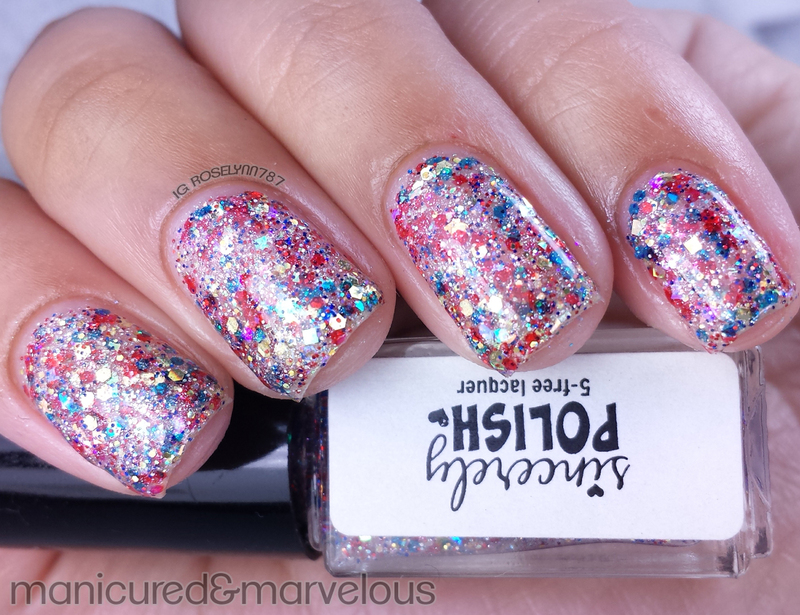 Are you a fan of chunky glitter polishes like this? Simply Enchanted by Sincerely Polish is available now while supplies last. There are some colors that are currently sold out as I stated, but this collection will be restocked at the end of May. Don't wait that long though and make sure you grab your favorite princess while you can! Your nails are just stunning! These colors are so bright and lovely. I really love the turquios color the best. I love all of them so much! There is a special place in my heart for the Arial one though. I think Snow White is really cool. The colors remind me a lot of Snow White's outfit. Actually Cinderella is an awesome color too! Holy cow these are INCREDIBLE!!! Such beautiful shades! Ariel is my favorite for sure. I've never seen lacquer that was quite this chunky. I love it! I love the Bella polish. I do like the sparkly polishes for my toes! I don't like them on my fingernails as well. Snow White is awesome! I love that color combo. These all have a lovely, icy effect. I don't wear too many glitter-packed polishes anymore but enjoy seeing them on others. Wow! Absolutely beautiful! Love all of these colors. Love Jasmine and Cinderella. I love all the sparkles and bling! I'll need to find something similar in my neck of the woods because I don't think I can find this product here! Thanks for reminding me, I need my nail done today,I'm overdue. I love the glitter nail polish and blue is my favorite from all of it. Jasmine is so beautiful!! Bummer that the formulas weren't great, though. I love all these colors. Jasmine is my favorite one. I love to change my polish a few times a week. You must have tons and tons of nail polish at home. These are beautiful selections! I would love to have my nails painted with any of these. Wow these are all so gorgeous! I love snow white and Ariel! Wow they are both so pretty! I love Ariel!! 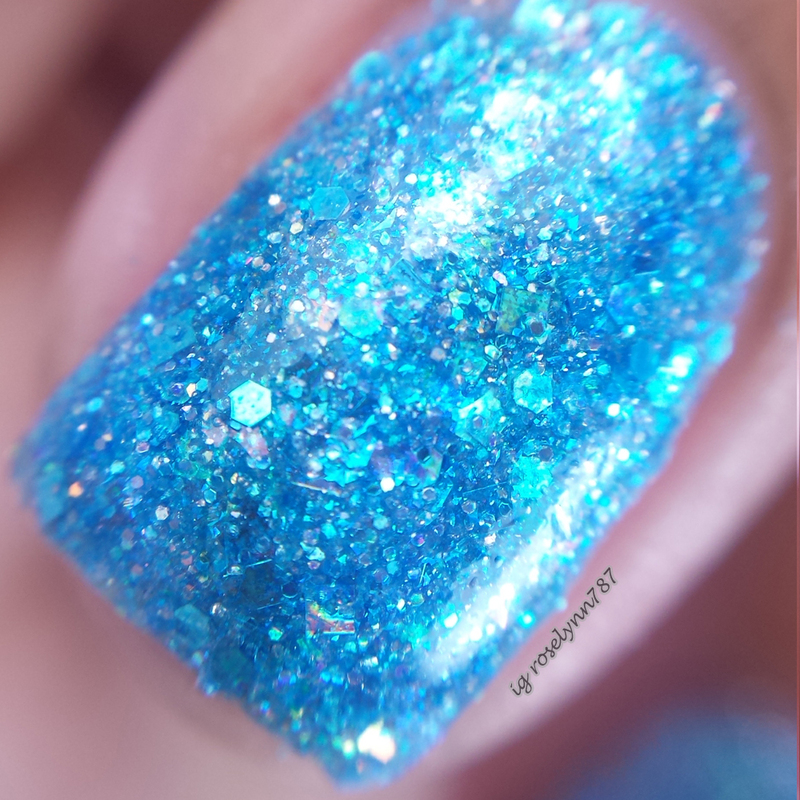 It's such a great glitter combo that definitely reminds me of the mermaid :) But Jasmine & Cinderella are gooooorgeous! I love how they're able to put the embellishments in the polish. It looks very glittery and pretty. Those are some great polishes. I have been getting mine done with a lot of glitter lately. These look fabulous! So much GLITTER! I really love Ariel and Jasmine! Chunky polishes are hit and miss for me. Gorgeous collection though! Oh wow, these look so awesome! I love glitter nail polish. Definitely checking this out. I know my daughter would love it too. Jasmine needs to get on my nails! Well those are FANCY! If I had a special occasion to go to then those would be perfect! If not, they'd probably be ruined before the paint dried but still pretty to look at in the mean time! Thanks! Oh those are so gorgeous! I love Jasmine's especially. The colors are lovely. I really love disney and you know wat I love the most? the cinderella one, it makes me feel like a real cinderella lol. I love the Jasmine. What a gorgeous color. I don't wear nail polish often, but I think that would make me want to try to wear it more. That blue glitter has a beautiful texture to it. I would love to try it myself! WOW, these look incredible. Such vibrant, fun colors. Would love to have my nails look that nice. These are some flashy colors. Maybe I will move out of my comfort zone a little. Those glittery nails look so enchanting and girly! I would love to try those on my nails however they are not exactly appropriate for the corporate setting. Oooo! I love Snow White and Aurora, but Belle's is nice too! What to choose, what to choose?! I love the glittery look on my nails and these are some totally amazing colors indeed. I love the Cinderella and the Belle colors the best. Thanks for sharing. I love the Belle. So pretty! I bet my greatniece who is so into different kinds of nail polishes would love those. I love the Belle polish. So pretty! I bet my greatniece who is so into different kinds of nail polishes would love those too. What a fun collection! I loooove Jasmine!